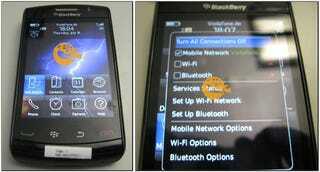 New York Times: BlackBerry Storm 2 Coming "This Week"
Tucked in a NYT story about RIM trying to keep up in this crazy world of iPhones and Androids is a mention that "this week, Verizon and R.I.M. are trying again with a Storm do-over, the Storm 2." The Times mentions its redesigned screen, that it actually "gives the user the sensation of pushing a physical button when pressing a number on the glass touch screen" and relates a really curious anecdote from Verizon Wireless CEO Lowell McAdams, who let some students play with it: "They came back and said ‘Oh, my gosh.' They were very excited. This is what they hoped the original Storm should be." Oh, I'm very sure it was. We'd hear from a Best Buy and Verizon leak it was coming soon, so no surprise, really.